Albert Tucker, one of Australia’s most important post-war artists, helped reinvigorate and re-mythologise the Australian landscape through his modernist approach. 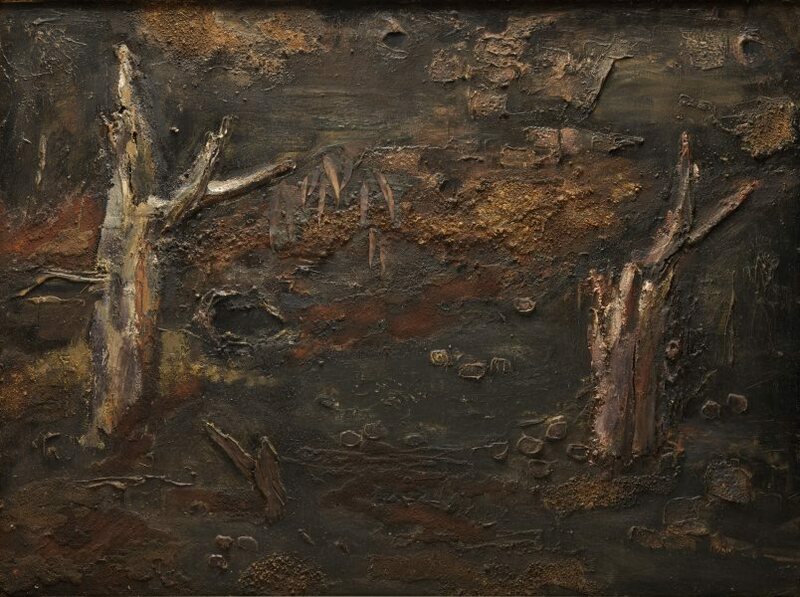 Along with Sidney Nolan, Joy Hester, John Perceval and Arthur Boyd, he was part of the group of artists active at Heide, near Melbourne, in the 1940s and enjoyed the patronage of John and Sunday Reed. Tucker left Australia in 1947 and spent the next thirteen years travelling and painitng in Japan, England, Europe and the United States. In Rome Tucker met the acclaimed arte povera artist Alberto Burri, whose use of PVA and mixed media to build up his paint surfaces inspired Tucker to adopt the approach. The built-up surfaces he achieved with PVA, sand and other materials incorporated with paint are a noted characteristic of his work and realistically depict the ‘gashes and wounds’ of the harsh Australian landscape. Such surfaces can be seen in ‘After the bushfire’ which combines blackened leaves and bark to depict the bush in the aftermath of fire. Signed and dated l.l., black charcoal "Tucker '66". Barry Pearce, Look , 'Albert Tucker: A chance for Sydney to get to know a Melbourne artist better', pg. 12, Sydney, Mar 2007, 12.